Right sided Sternomastoid tumor (Torticollis). 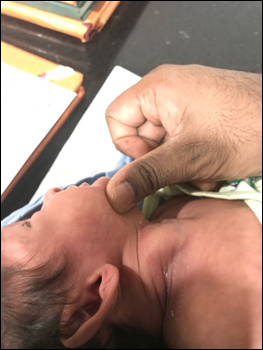 There is a swelling in the neck usually seen after birth. The baby mostly looks towards the opposite side. It usually responds to physiotherapy. Rarely needs surgical correction. 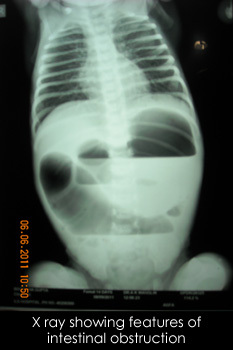 A newborn has abdominal distension, vomits out greenish liquid (bile) or milk immediately after feeds, does not pass or passes scanty black stool (meconium). He/ she may become lethargic. One may see moving sausage shaped lumps in the abdomen (visible peristalsis). What are the ailments which lead to intestinal obstruction in a newborn baby? There may be complete non development of a part of our intestinal tract, in which case the baby shall not be passing meconium at all or may pass whitish mucus (Intestinal atresias). 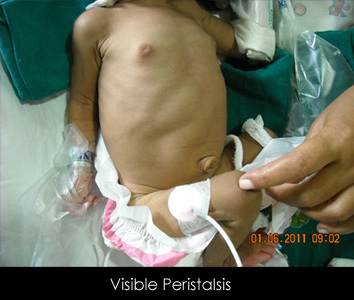 There may be obstruction at the outlet of the stomach (pyloric stenosis). There may be compression from outside at various areas of the gastro-intestinal tract (malrotation / band obstruction). What is the management of such situations? In all the situations mentioned above, a Pediatric Surgical consultation is a must. Most of these ailments can be completely cured by a competent Pediatric surgeon unless there are already irreversible complications. Are contrast studies harmful for newborns? In adults, barium studies are a common diagnostic tool to diagnose the site of intestinal obstruction. But in babies, a contrast study (a series of x-rays) involves too much exposure to radiation. CT scan involves even greater degree of radiation. If at all required, we do a contrast screening under fluoroscopic guidance, which involves a much lesser amount of radiation. Isn’t a major surgery too risky for a newborn? A newborn with an intestinal obstruction is already in a very critical state and all the parameters are already compromised. Surgery, in the hands of an experienced team, carries minimal morbidity. An experienced team includes an experienced Pediatric surgeon, an experienced anesthesiologist, an experienced team of properly trained nursing staff to care for newborns and a proper Neonatal Intensive Care Unit. What are the recent advances in the management of a newborn with intestinal obstruction? 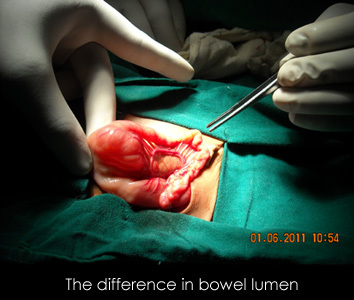 Parenteral nutrition: Nowadays in babies with necrotizing enterocolitis and other ailments where a portion of the alimentary tract is damaged, we put in a long line and administer total parenteral nutrition which has improved the outcome of neonatal intestinal obstruction babies to a great extent.